The reinstallation of the Getty Villa collection is now in full swing. We are reimagining our displays to show the evolution of ancient Mediterranean art over several millennia and within particular cultures. Two years in the planning, the task of renovating thirty galleries has also given us an ideal opportunity to explore the collection with fresh eyes. Among the innovations in store is a new gallery devoted to the arts of the Etruscans, who flourished in central and northern Italy from the 8th to the 1st century B.C. When curators surveyed the collection in storage, a number of intriguing objects came to light. One surprise was a group of fragments belonging to a “comb brooch,” used to fasten a cloak. The ornate clasp consists of multiple hooks (like the teeth of a comb) attached to a gold-laminated silver plaque embellished with filigree, a technique of applying wires to create lacy patterns. 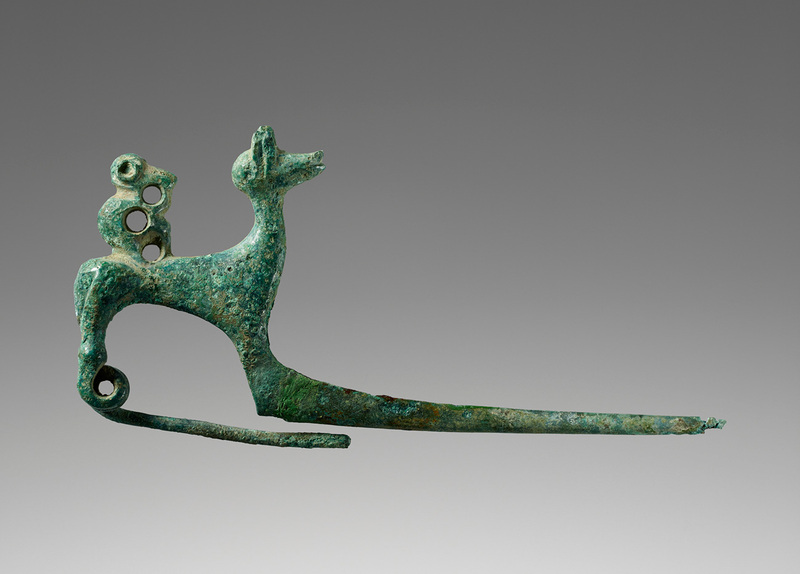 At slightly over two inches long, the brooch exemplifies the Etruscans’ mastery of fine metalwork and metallurgy. For the last decade, part of this object was displayed in a gallery dedicated to women in the ancient world. Archaeological excavations tell us, however, that such showy clasps were in fact worn by men. At the southern Etruscan site of Cerveteri, male ancestor figures from the Tomb of the Five Chairs don a rounded mantle secured at the right shoulder with a similar brooch. (Note to observant readers: although men occasionally sported earrings, this head was wrongly restored and actually belonged to another statuette of a female ancestor, which was not preserved.) Standing out against the red plaid textile, their clasps were prominent badges of honor and wealth. Flamboyant gold examples, unearthed in two princely tombs at Palestrina outside Rome, were studded with figures of animals and fantastic creatures. Mythological monsters, the filigree technique, and even the seated statue type were imports from the Near East. 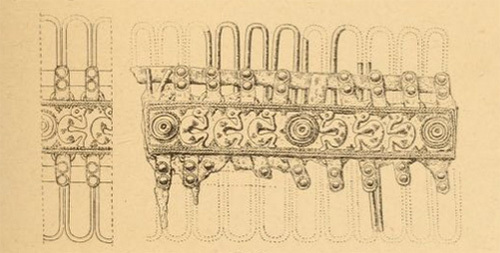 With its novel comb-like closure, this clasp was evidently a local Etruscan fashion. Brooches are among the profusion of ornaments, including buttons, pendants, and bracteates (foil appliqués sewn to textiles), that decorated clothing. On display will be several of the ubiquitous garment pins known as fibulae: a bronze leech fibula inlaid with amber from the North or Baltic Sea region, a gold leech fibula with foil rosettes, and a bronze fibula in the shape of a monkey riding a small horse. 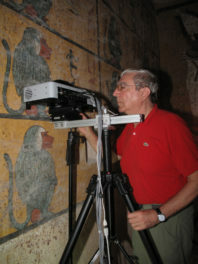 Monkey fibulae and other Egyptian-style artifacts occur throughout much of the Italian peninsula during what is conventionally called the “Orientalizing” period (720–580 B.C. ), and they may be related to fertility. Notably, these types are largely found in the burials of women. Styles changed quickly. Not only can jewelry help to track trade patterns and date find-spots, it can also be used to distinguish gender and social identities. By contemporary Greek and Roman standards, well-to-do Etruscan women, men, and children enjoyed accessorizing—ancient authors regularly accused them of extravagance. 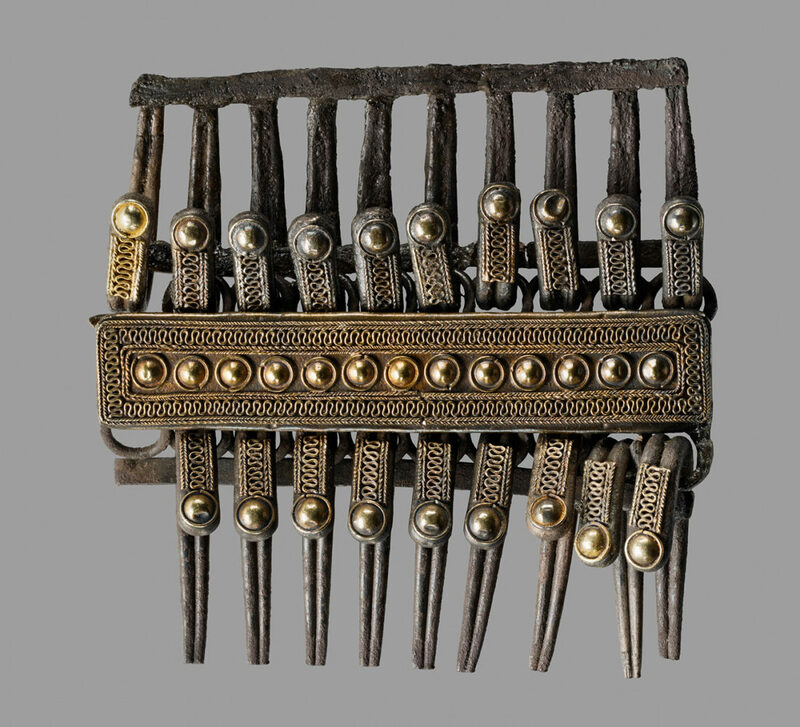 Comb brooches, however, are relatively rare. Ours came to the museum as a donation over thirty-five years ago, and its find-spot was not recorded. For the closest parallels, we can look to the cemeteries in Marsiliana d’Albegna, Vetulonia, and a few other northern Etruscan settlements, where burials replete with luxury objects in precious metals, ivory, amber, glass, and bronze have been uncovered. Jewelry and clothing ornaments were worn in death to advertise status and prestige. Several silver and gold comb brooches—one with monkeys holding their faces in their hands (like the bronze fibula pictured above)—show comparable rectangular plates with hooks and loops. The tombs in which they were placed also held spear blades and ax heads associated with males. In the case of the Marsiliana brooch, its owner’s rich grave was equipped with weaponry, an iron funerary bed, horse trappings, and a full-scale chariot and carriage. Such contexts fill in our picture of the kit and dress of the elite ranks of Etruscan warriors. Cloaks clasped at the shoulder are the forerunners of the paludamentum and lacerna worn by Roman emperors and field commanders. Because the hooks found in storage were in good condition, we embarked on a project to put the pieces back together. Reconstructing the brooch called for a three-pronged approach: studying its manufacture, analyzing the chemical composition, and restoring the object to nearly its original appearance. The ancient jeweler fabricated separate components, consisting of a central plaque and two hook assemblies. A rectangular silver plate with ten silver loops soldered onto each long side forms the core of the plaque. Thirteen circular gold bosses and filigree, made from twisted bar-type and round wires set in a serpentine pattern, were soldered to a gold sheet, possibly aided by a flux such as chrysocolla (literally, “gold glue”). Under the microscope, we observed that some areas had been overheated, causing the twisted wires to melt and flow together. Made free-hand, the filigree design is held together by minute welds joining the curved wires and affixing them to the borders. The edges of the assembled gold sheet were then folded over the silver plate to form a decorative sheath. Thicker silver wires were doubled and bent at the end into hooks, each of which was embellished with a roundel and a length of filigree. How did the clasp function, especially in the absence of a pin and catch plate as seen on the fibulae above? We concluded that it may have been stitched into the hems of a mantle, leaving the ornate top exposed. A complete brooch in the Antikensammlung in Munich supplied the model for attaching the central plaque and the hooks. 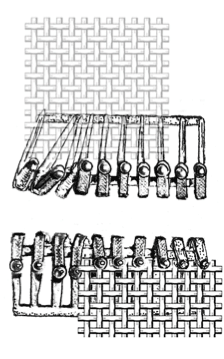 They were linked together with a pair of silver strips to form two assemblies of ten hooks each. In turn, the hooks were threaded through the silver loops. In all, nineteen of the original twenty small hooks were rejoined and the brooch was cleaned, revealing its lustrous surfaces. With their soft golden highlights, the filigree wires and roundels make a striking contrast against the silver hooks. The pale color led some archaeologists to describe the metal as electrum, an alloy of gold and silver. To determine precisely which metals—silver, gold or electrum—were used to make the different parts, we carried out elemental analysis using a scanning X-ray Fluorescence (XRF) spectrometer. This gave us distribution maps of the individual chemical elements. The core of the plaque and the hooks were found to be composed of silver with trace amounts of copper (by way of reference, sterling silver contains 7.5% copper). The sheath of the plaque and tops of the hooks consisted of gold, with minor amounts of copper and silver. On the pointed ends of some hooks is a golden patina, which we initially suspected might be gilding. But the element distribution maps show no gold there, nor any electrum. What, then, was causing this color? The answer lies in the second map, which revealed that these areas contained bromine (Br) and chlorine (Cl). 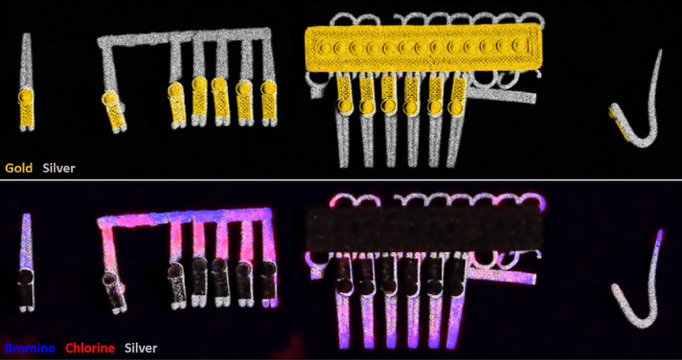 These elements suggest that the gold color on some hook tips is the result of metal deterioration. Chlorine is often found in the corrosion layers of objects recovered from the soil. Much less common, bromine signals specific burial conditions: silver chloride-bromide forms in high-humidity saline environments, such as moist soil or seawater. This observation sheds light on the burial conditions—in this case, almost certainly a tomb that had been subject to periodic flooding over the centuries. The Getty’s elegant comb brooch demonstrates the expertise of Etruscan jewelers, whose skill magnified the intrinsic worth of precious materials. Where did they obtain the metallic ores? Iron and copper abounded in the Colline Metallifere (metal-bearing hills) of northern Etruria. Exploitation of natural resources transformed late Iron Age settlements into prosperous hubs of commerce. Silver and gold, on the other hand, were not available locally and were likely imported from mines in southern Spain and the island of Sardinia. Further analysis, focusing on minor and trace elements, may define a chemical signature characteristic of the primary ore and would help identify the location from which it was extracted. In the 8th and 7th centuries B.C., maritime trading grew to meet the demand for metals, and Phoenician merchants dominated the commercial networks. They conveyed cargoes of raw materials and luxury goods from the Levant at the eastern end of the Mediterranean Sea to the Atlantic seaboard of the Iberian Peninsula, with ports of call in Greece, North Africa, and Italy. Avid mariners, the Etruscans also became a naval power to be reckoned with. At the peak of their prosperity, they had expanded beyond Etruria (modern-day Tuscany) south to Campania and north to the Po River Valley. International exchanges introduced new artifacts, imagery, technologies, and immigrant artisans—in short, new ideas. This splendid brooch reflects a unique blend of tradition and invention, which defined Etruscan society in one of the first great eras of globalization. The art of Etruria represents a significant chapter in the larger story of classical antiquity. Including works not previously on view, the future display will present bronzes, pottery, sculpture, wall-painting, and jewelry made over six centuries by and for the Etruscans. Beyond their aesthetic qualities, the objects tell us about a complex society that formed close ties with the Near East, Egypt, and Greece and laid the foundations for aspects of Roman architecture and religion. Such interactions among civilizations will be one of the governing ideas behind the Getty Villa’s reinstallation and programs. The gallery is on track to open in November; stay tuned for updates on our latest discoveries and research. 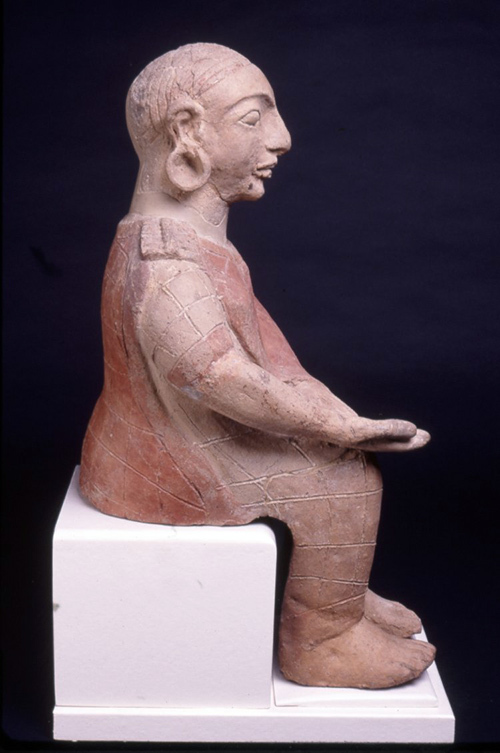 For a comprehensive overview of the Etruscans, see Jean MacIntosh Turfa, The Etruscan World (2014), and articles by Maurizio Sannibale, “Orientalizing Etruria” (pp. 99–133); Françoise Gaultier, “Etruscan Jewelry” (pp. 914–27); and Stefano Bruni, “Seafaring: shipbuilding, harbors, and the issue of piracy” (pp. 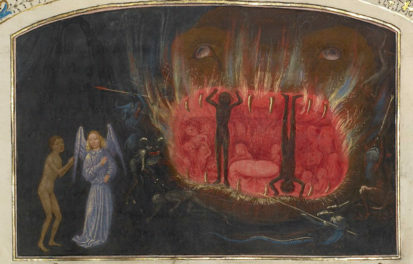 759–77). Larissa Bonfante, Etruscan Dress (2003), on the history of clothing and jewelry. 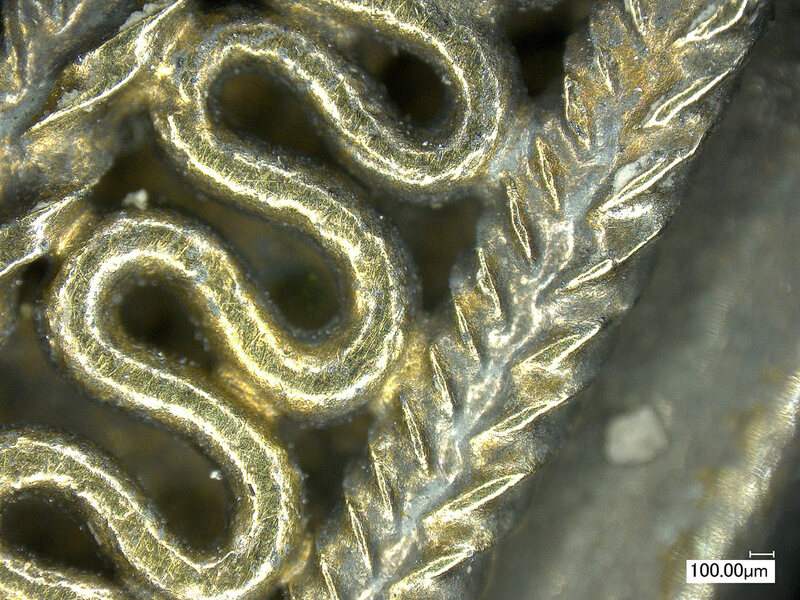 Emilio Mello, Paolo Parrini, and Edilberto Formigli, “Etruscan Filigree: Welding Techniques of Two Gold Bracelets from Vetulonia,” American Journal of Archaeology 87.4 (1983), pp. 548–51. Mauro Cristofani and Marina Martelli, L’Oro degli Etruschi (1985) pp. 80–83, 107, and 113, presents seven centuries of Etruscan gold-work, including jewelry from Palestrina, Cerveteri, Marsiliana d’Albegna, and Vetulonia. At the J. Paul Getty Museum, I am curator of antiquities and am responsible for organizing the new gallery of Etruscan art. My research interests center on the art and archaeology of pre-Roman Italy, Sicily, and Greece. The brooch is An Absolutely amazing artifact. I have really enjoyed reading about it, thankyou. 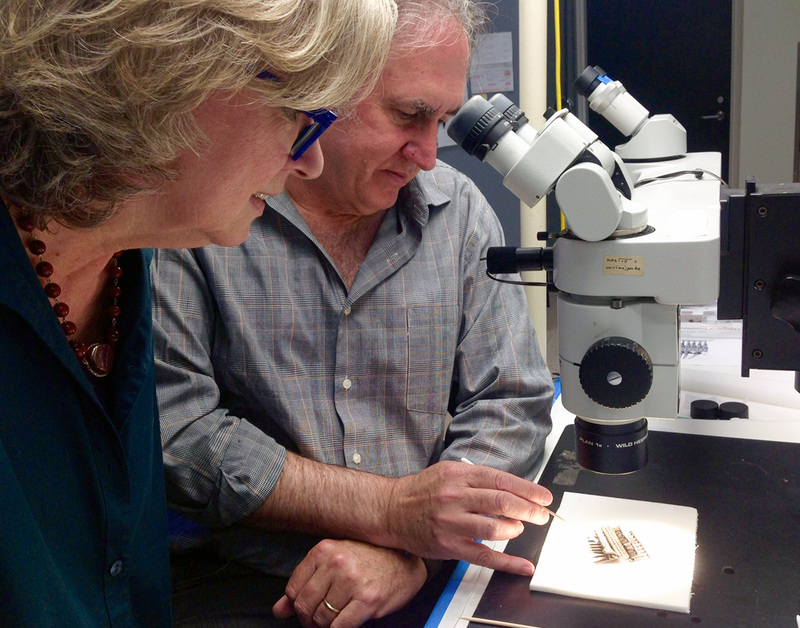 What an impressive conservation department you have at the Getty! Thanks for preserving history so future generations can enjoy and learn. 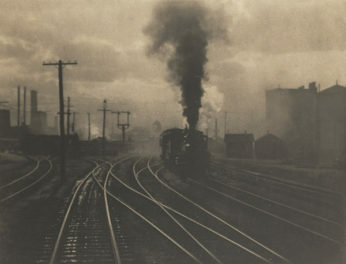 Wonderful article, I can’t wait to take in the exhibit! I love those Etruscans! I have long been intrigued by the look of contentment on the faces of sarcofigi and other images. I have a secret suspicion that it was from a substance that grew in their fields. Or very good wine and a love of life, the same that my amici in Italia still hold dear.